Breaking!! Ford: We're #4! We're #4! Yikes. Aside from being knocked off the number two plinth by automotive juggernaut ToMoCo and losing $12.7 billion, FoMoCo must endure the additional dishonor of being pushed back to the number four sales spot by Dr. Z's Moustache Daimler-Chrysler for the month of January. There may be a silver-lining to these gray clouds, though. Ford said that their sales to rental car companies is down 65% as compared to January 2006. Which, if you are to believe what Adrian Imonti over at TTAC is saying about rentals (we do), is good long-term news. In the short-term? How many different ways can we look at Ford and say, "Ouch — that's got to hurt?" 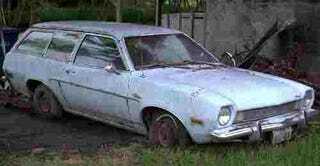 Also, it is definitely time to bring back the Pinto Shooting Brake. At this point in time, why not?